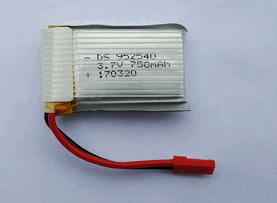 When using high energy Li-poly Battery, please do not over-discharge, over-charge batteries, or result over-high temperature. Discharging capacity can&apos;t exceed 80% of the max capacity after full charging to ensure a good cycle performance.Recommend to full charge a brand new battery before using and only discharge the battery 50% for first 5 times to make a good efficiency of the battery. Please make it a habit to always count time for flight, or please set a low voltage protection on ESC (Cell voltage after stopping using can not lower than 3.4V). Do not use the battery at insufficient of voltage. 3.Do not overcharge or overdischarge batteries. It will decrease the batteries&apos; service life.